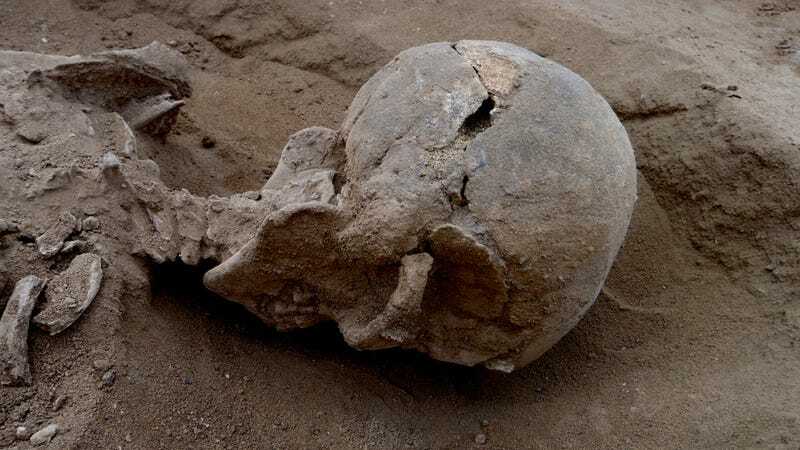 Anthropologists working in Kenya have uncovered the remains of a group of prehistoric foragers who were ruthlessly massacred about 10,000 years ago. It’s considered the earliest example of organised violence among nomadic hunter-gatherers, a rare find that’s offering an unprecedented glimpse into what life — and death — was like for prehistoric foragers. Archaeological evidence of warfare is abundant among settled societies, but the same cannot be said for prehistoric hunter-gatherers. This is why the discovery of 27 foragers who were killed in a massacre some 10,000 years ago is as unique as it is important. In grim detail, it shows what the dark side of life was like for ancient hunter-gatherers, while at the same time extending the history of human warfare. The details of this work, conducted by researchers from Cambridge University’s Leverhulme Centre for Human Evolutionary Studies (LCHES), can now be found in the latest edition of Nature. A male skeleton, found lying prone in the lagoon’s sediments. The skull has multiple lesions on the front and on the left side, consistent with wounds from a blunt implement, such as a club. Image by Marta Mirazon Lahr, enhanced by Fabio Lahr. The team, led by Marta Mirazon Lahr of the University of Cambridge, discovered the remains 18 miles (30 km) west of Lake Turkana, Kenya, at a site called Nataruk. Twenty-one of the 27 individuals unearthed were adults: eight male, eight female, and five unidentified. The partial remains of six children — all under the age of six, except for one young teenager — were found close to the bodies of four adult women and some partial remains. 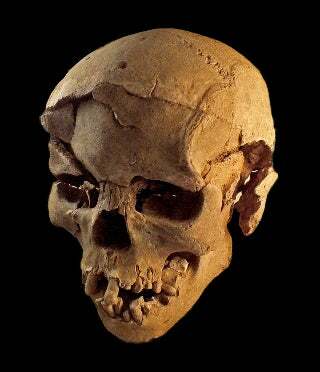 This skeleton was that of a man, with lesions on the left side of his skull consistent with a wound from a blunt implement, such as a club, and a perforating lesion on his neck vertebrae consistent with an arrow wound. Image by Marta Mirazon Lahr. These foragers died in brutal fashion. Ten of the skeletons exhibited signs of a violent death, including extreme blunt-force trauma to the skull and cheekbones (possibly delivered by a wooden club), signs of arrow lesions to the neck, stone projectile tips lodged in the skull and midsection of two men, and numerous broken hands, knees, and ribs. 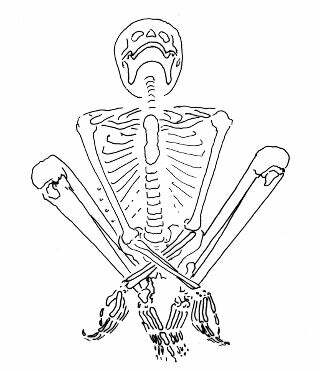 A skeleton of a female found reclining on her left elbow, with fractures on the knees and possibly the left foot. The position of the hands suggests her wrists may have been bound. She was found surrounded by fish. Image by Marta Mirazon Lahr, enhanced by Fabio Lahr. None of the bodies were buried, and were likely left to rot where they died. Some individuals had fallen into a lagoon, allowing their bones to be preserved in sediment. 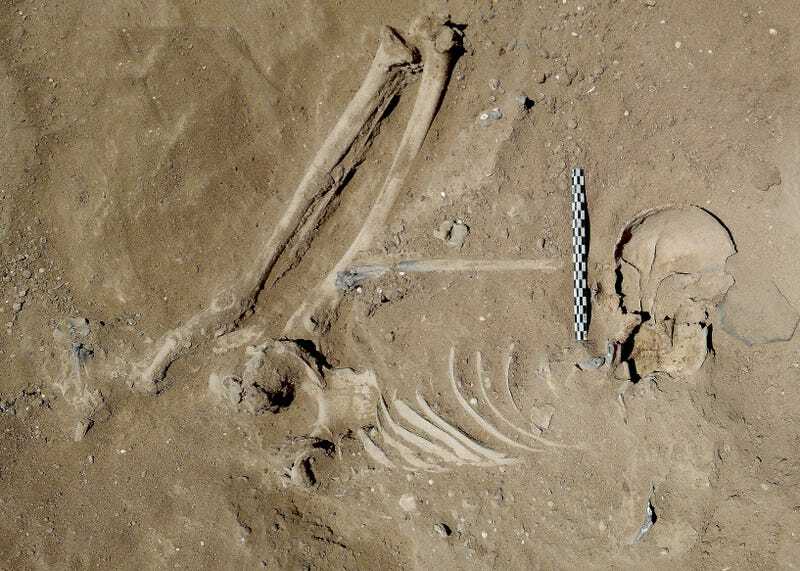 A number of skeletons with severe skull fractures were found face down. The positions of four bodies suggests they were bound and tied, including a woman in the late stages of pregnancy; the bones of her nine-month-old foetus were also recovered. It’s not known why she and some others were bound in this particular way. As the depiction at left shows, the pregnant woman was found in a sitting position, with her hands crossed between her legs. One adult male appears to have been hit in the head by at least two projectiles, followed by a blow to the knees with a blunt instrument, and then finally falling face down into the lagoon’s shallow water. Another male took two blows to the head, crushing his skull at the points of impact. The researchers were surprised at the roughly equal proportion of males to females. Typically in such encounters, the victors, after killing the men, claim the surviving women and children. But at Nataruk, no one appears to have been spared. 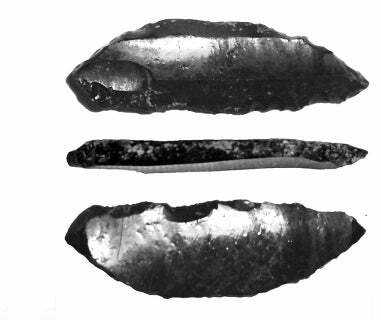 The researchers also discovered bits of arrow or spear tips, two of which were made from obsidian, a black volcanic rock that can be worked to razor-like sharpness. The presence of this rare material suggests the two groups came from different home ranges. 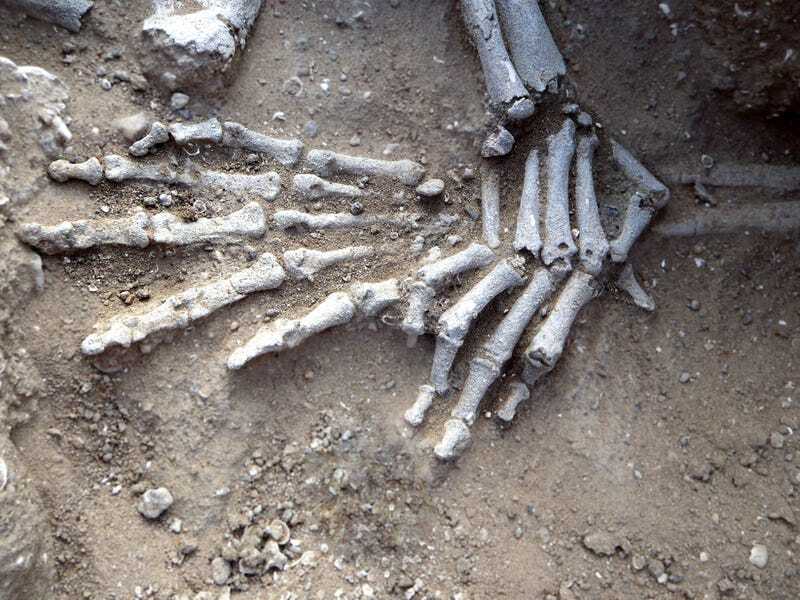 Carbon dating places the skeletons to between 9,500 to 10,500 years ago, around the start of the Holocene Epoch. Today, this area of Kenya is arid scrubland, but back then it was a fertile lakeshore capable of sustaining a significant population of hunter-gatherers. The site of the massacre transpired at the edge of a lagoon near a large lake. The researchers theorise that the massacred remains belonged to an extended family group of hunter-gatherers who were brutally attacked and killed by a rival group of prehistoric foragers. They say it’s the earliest scientifically dated historical evidence of human conflict, and a precursor to organised warfare. The location of the massacre occurred in a highly desirable place as the foragers would have had easy access to drinking water and fishing. It was likely coveted by rival groups, giving rise to territorial disputes. The researchers caution that Nataruk could just be an example of a “standard antagonistic response” between two groups who happened to run into each other. We’ll likely never know the true reasons for the massacre at Nataruk. The origin of war is a contentious issue among anthropologists, with some saying it’s an atavistic remnant of our species’ more brutal evolutionary past, while others suggest it’s a consequence of ownership and resulting disputes over access to land, water, food, and other resources. Top image: Skeleton KNM-WT 71255 after excavation. This skeleton was that of a man, found lying prone in the lagoon’s sediments. The skull has multiple lesions on the front and on the left side, consistent with wounds from a blunt implement, such as a club. Image and caption by Marta Mirazon Lahr, enhanced by Fabio Lahr.